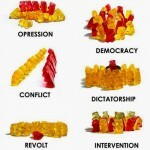 Gummy Bears may be small but they can represent some big words. Your job is to select a social studies vocabulary term and use this candy to create a model of the word. Some terms you might consider: urban, longitude, citizenship, immigration, colonization, etc. Use Gummy Bears to describe your word. Your model must be no larger than 5 inches x 8 inches. Entries must include your name, grade, teacher, vocabulary word and definition. Use an index card or this entry form. Deadline for all entries is Monday, April 15th.